In Finland, we take food seriously. We want to eat healthy, we study nutrition and even had multi-year country-wide program to get middle-aged men eat more healthy. We don’t fall into eating fads; “LowCarb Diet” or “SuperFoods” are marginal here. 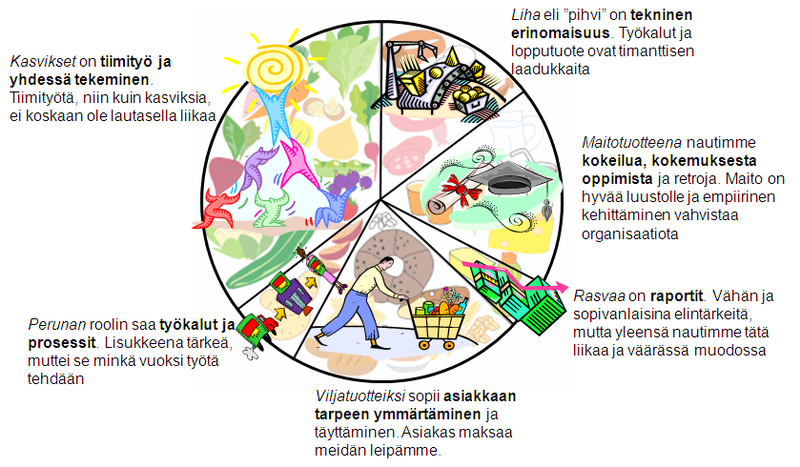 One example of seriousness is Nutrition Chart, or Nutrition Circle (“Ravintoympyrä” in Finnish). We learn it at school, every reputable food company presents it on their web and we are supposed to keep a balanced nutrition by following that. Balanced. Healthy. No silver bullet. Serious. Requires attention but is actually part of your day. How about Agile Nutrition Chart, what would that look like? Here is my take: what would be a guideline to healthy and balanced diet of Agile thinking & practices. I copied one nutrition circle and tried to think of Agile ingredients. Feel free to use this (don’t forget to mention where you got this). You can change names of the sectors to fit your needs. Remember this is on the lighter side of Agile, half-serious at most. I plan to use this, however, when I talk with people who struggle to understand the big picture. Maybe in Finland, this picture give people a feeling that Agile is about balance and not overkills. Discipline and not magic diets. Here’s my Agile Nutrition Chart. Captions in the picture are in Finnish and you can find the English version from the text below. Fruits and vegetables are team-work and collaboration. Just like salad, team-work is often missing from our plate, and you can not replace veggies with any other sector in the chart. Meat and fish in Agile is technical excellence. That’s “the beef” in our work. Our tools and products are of excellent quality and we aim to make perfect products, ready to ship at the end of each iteration. Dairy products represent experimenting, learning, adaptive process control and retrospectives. Milk makes our bones stronger and learning together makes our organization stronger. Fats and sugar are reports. A little these are needed, but they need to be right kind and recommended to come along with other intake rather than added ingredient. Cereal products and bread is customer understanding and fulfilling customer need. That is what bring bread to our table, that’s why we are creating our products and services. Finally we have potato (yep, that’s a separate sector in Finnish nutrition chart). That one is processes and tools. Again, needed but definitely not the largest portion on your plate. It’s side dish, complementing your portion. It’s not why we are at work, it alone won’t make our dish delicious. Especially, you can not replace the green stuff with potato and rice; you can not replace team work with tools. Do you have these in balance? Are you being attracted by “Magical Super Diet” that claims miraculous results by focusing on one thing? And if it was lunchtime already, did you remember to eat enough vegetables? Thanks for the comment. Comment about fat originates from a colleague of mine at NSN. He once said (regarding Agile Manifesto): “Documentation is like cholesterol; useful and needed in small doses but usually we have too much and wrong kind”. I hope all the reports would be (a) automatically generated or (b) come semi-automatically along with other work. Having additional task to “create report” is like adding a slice of bacon on ham sandwich.